Here’s the complete list of TBE April links. 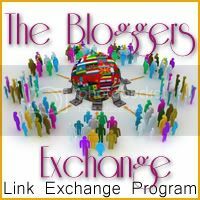 Please copy/paste the whole list and submit your POST/PAGE LINK HERE to make sure your blog will be visited.Thank You! This entry was posted in The Bloggers Exchange and tagged tbe april link, the bloggers exchange on April 3, 2011 by Yami. Thanks for joining again sis! Drop by my STREET. Please don’t forget to follow me @ GFC & NetworkedBlogs. Thanks very much! visiting you here via TBE April!